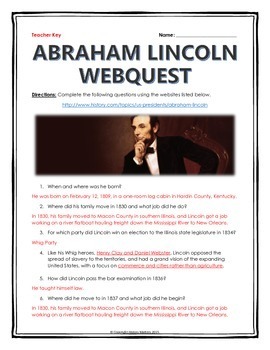 Abraham Lincoln - Webquest with Key - This 8 page document contains a webquest and teachers key related to the basics of the life of Abraham Lincoln. It contains 26 questions from the history.com website. 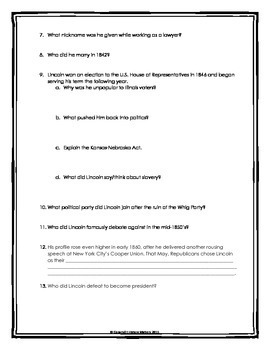 Your students will learn about the life of Abraham Lincoln in the United States. It covers all of the major people, themes and events in the life and significance of life of Abraham Lincoln. Specifically, your students will learn about the early life of Abraham Lincoln, his time as President and during the Civil War, and much more! 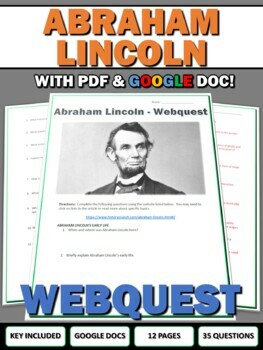 A great tool to teach the history of the life of Abraham Lincoln. Would also make a great activity for a substitute or for homework if students have access to the internet at home! 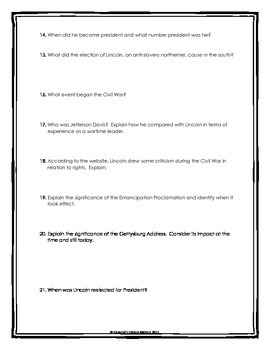 A great activity to learn about the history of the life of Abraham Lincoln.